Alton Towers is the UK's premier theme park aimed at the thrill-seeking and young-at-heart, and can be a welcome excursion for those who have overdosed on the culture and tranquillity of the Cotswolds. 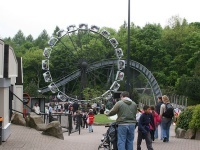 Rides with names such as Nemesis, The Blade, Submission and Ripsaw are definitely not for the faint-hearted, but the park does cater for the whole family with an adventure land and farmyard for younger visitors, as well as a hugely popular Charlie and the Chocolate Factory ride. For those exhausted by the day's antics, Alton Towers operates its own hotel, and there are plenty of spots to grab a bite to eat.